Here's a pair of images from Flickr user showing the mountains at the edge of Scoresebysund, the world's largest fjord. 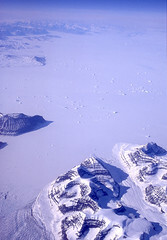 The first image looks north across the central part of the frozen fjord, dotted with icebergs. At left is Cape Stevenson, where the fjord divides into its western branch (the Gasefjord) and the northern branch (Hall Inlet), which stretches off to the upper right. 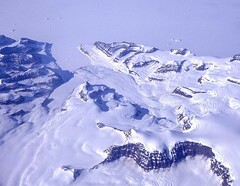 The next image, slightly to the east, shows mountains and a glacier along the fjord's southern edge. Not so green showcases aerial photographs from Greenland and from around the world taken by Flickr users, and locates each image on a map using Google Maps and Google Earth. More details.